The Veil is thinning. Can you feel it? As fall approaches, the nights are growing longer and colder, and we’re drawing closer to the Spirit Realm than ever before. This All Hallows’ Grid was created to accompany you on your journey into the shadows. 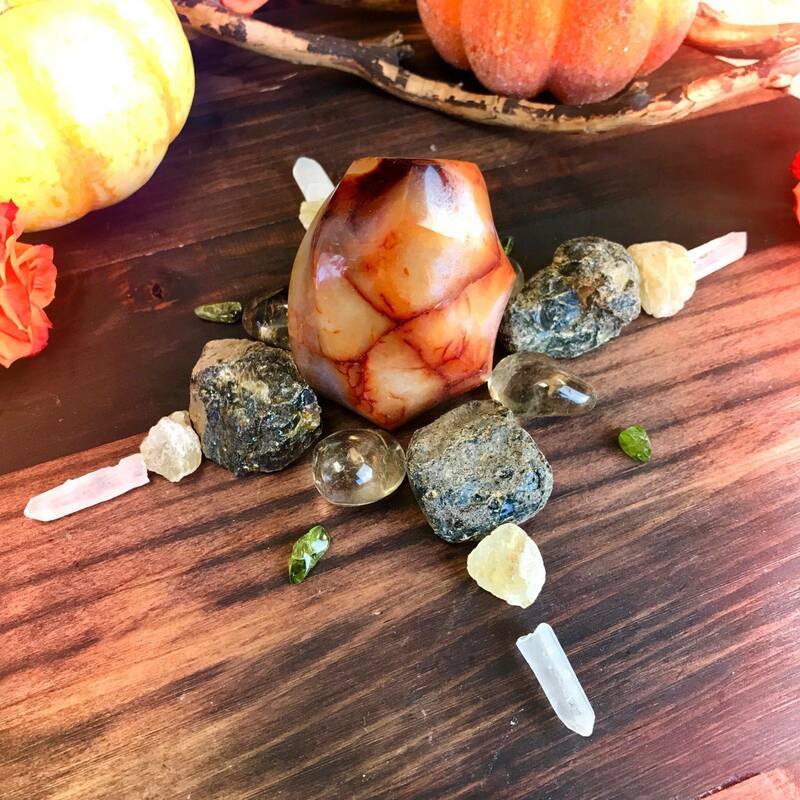 As we approach Samhain and Halloween, work with this grid to harness the season’s energies of transformation, healing, and Spirit connection – all while staying stable and protected. One (1) carnelian flame (about 2-3”). Carnelian is a gem of fire. This stone brings courage, creativity, and passion and provides a potent boost in energy. In the shape of a flame, this gem helps you access the deeper parts of yourself. Gemstone flames draw you into the levels of yourself that may not be readily accessible to you right now. Use this carnelian flame as the center of your grid. Let it infuse your space with its fiery energy, helping you create powerful magic on All Hallows’. Four (4) dark amber gems (about 1’’ each). Dark amber carries serious protection magic. It prevents psychic attack and creates an energy shield around you. If you are feeling drained and defenseless, this stone will help you feel deeply held and safe. It has been used for this exact purpose for thousands of years. Four (4) golden topaz gems (about 0.75” each). Golden topaz is a deeply sensitive stone. It was revered in ancient times as a talisman of emotional growth and protection. The Romans believed golden topaz had supernatural powers and could cure any illness. 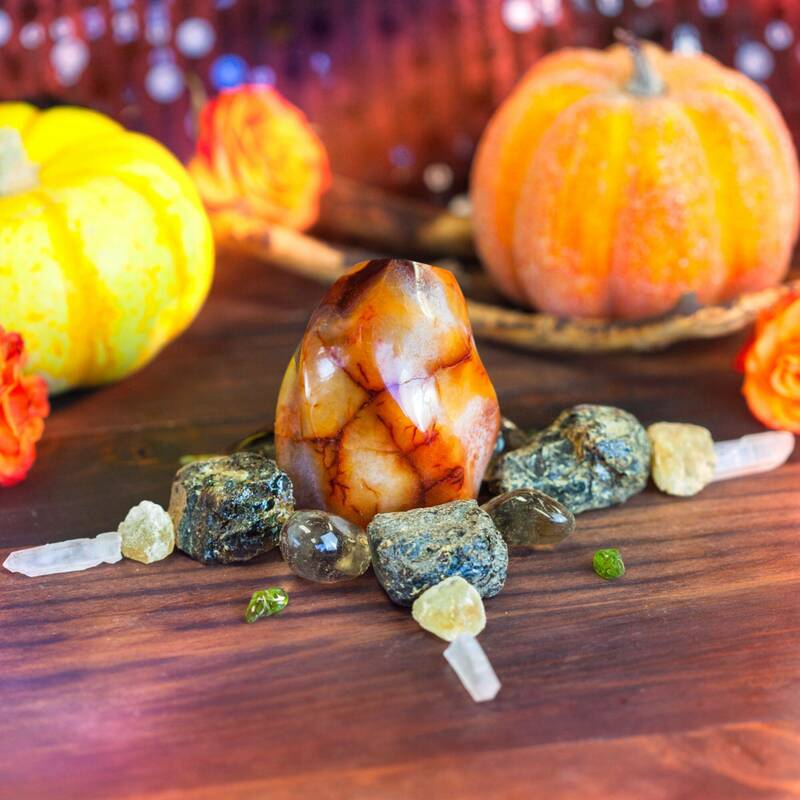 Today, we know that topaz is an emotional healer and messenger of clarity for the bearer. It is a very helpful stone for trauma recovery and assists you in integrating wisdom from hurtful experiences. Four (4) citrine gems (about 0.75” each). A powerful Sacral and Solar Plexus Chakra stone, citrine increases clarity of thought, awakens creative imagination, and amplifies the powers of will and manifestation. It activates and enhances mental clarity and stimulates your ability to create. It also is helpful in finding your power and using your abilities to unlock your soul’s potential. Four (4) peridot gems (about 0.25” each). The ancient Greeks and Romans thought peridot had special powers as a Wayseer’s Stone. It was thought that in the night, peridot glowed from within and would lead seekers to their intended path – often toward treasure! Peridot is believed to bring luck, bounty, and wealth to the bearer. It draws abundance energy, opens the Heart Chakra, and attracts opportunity. Four (4) quartz points (about 1” each). Quartz is a stone of magnification, intensification, and sealing of intentions or spells. 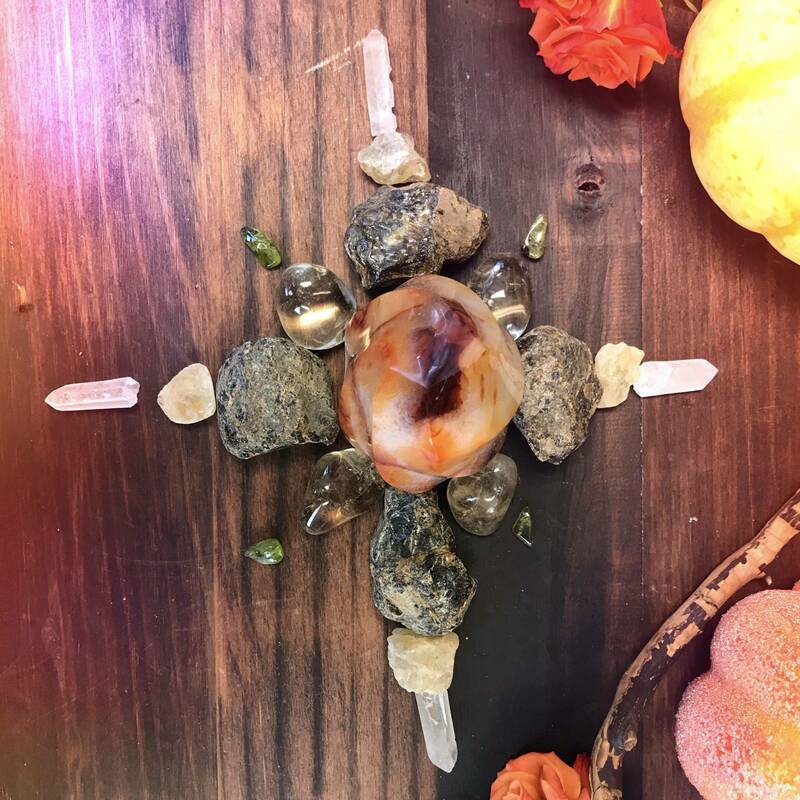 Place these quartz points at the corners of your All Hallows’ Grid to amplify its energy and send it in all four directions. This listing is for one (1) All Hallows’ Grid, as described above. Yours will arrive lovingly parceled along with a single leaf of white sage and a parchment describing the properties of the stones.